The Living City Policies for Planning and Development in the Watersheds of the Toronto and Region Conservation Authority (LCP) is a conservation authority policy document that guides the implementation of TRCA’s legislated and delegated roles and responsibilities in the planning and development approvals process. Comparable to a combined municipal official plan and zoning by-law, the LCP represents a compilation of existing plan and permit review policies and practices that have evolved over time. It also contains new policies related to TRCA programs, scientific research, and external planning and development initiatives. To guide TRCA review of planning applications and environmental assessments. To provide the basis for approving permit applications under Section 28 of the Conservation Authorities Act. To inform TRCA’s advocacy role for The Living City in the planning and development process. To assist and enable our partners’ and stakeholders’ contributions to building The Living City. Under the Conservation Authorities Act, a conservation authority implements a program to further its “objects” of conservation, restoration, development and management of natural resources. TRCA’s main program previously guiding the Authority in its planning and regulatory roles was the Valley and Stream Corridor Management Program (VSCMP) endorsed by the Authority in October 1994. The LCP supersedes the VSCMP while continuing and expanding on the VSCMP’s valuable foundation of principles and policy intent. 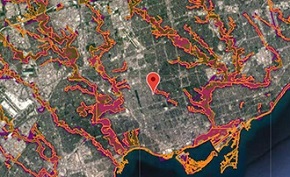 Since the VSCMP was first introduced, many changes occurred in the quality and extent of scientific understanding of TRCA watersheds, as well as changes to the planning, development and growth management realm of the GTA. The process to develop The LCP included the completion of many TRCA projects such as watershed plans, natural heritage strategies, and the development of new technical guidelines or the update of existing ones. Each of these discrete projects included their own elements of public and/or stakeholder consultation. In addition, TRCA created the Planning and Development Procedural Manual, which provides technical guidelines and procedural information for many of the policies found in the LCP. The intent of the Procedural Manual is to enhance TRCA’s cooperative working relationship with municipal partners, the development community, and permit applicants regarding the implementation of TRCA’s planning and regulatory functions, including opportunities to increase procedural transparency and streamline the review process where feasible.